In the past two weeks, I have talked to some officials of the Department of Transportation and Communications (DOTC) on the issue of the impending fare hike in the LRT and MRT. I have also asked for documents including the rail study that the department conducted which was used as the basis for the fare hike. They have yet to provide the documents although they have repeatedly assured me they will do so soon in the spirit of transparency. But while I have not yet seen the documents explaining the details behind the fare hike, I have confirmed at least one important fact thru my conversations with the DOTC officials. This is the issue of debt, which I argued in a previous post is the biggest reason behind the so-called losses of government in the MRT operation. The long and short of the fare hike is that the Aquino administration wants the 1.2 million daily commuters of the MRT and LRT, of whom 7 out of 10 earn less than P10,000 a month said one study, to directly shoulder an even larger portion of the said infrastructures’ debt burden. The rule of thumb for large infrastructure projects like the LRT/MRT is that 85 percent of the total cost represents debt, said one DOTC official. This means that 85 percent of what government claims is the actual cost of an MRT ride, which is about P60, accounts for the debts incurred by the private consortium that built the infrastructure. 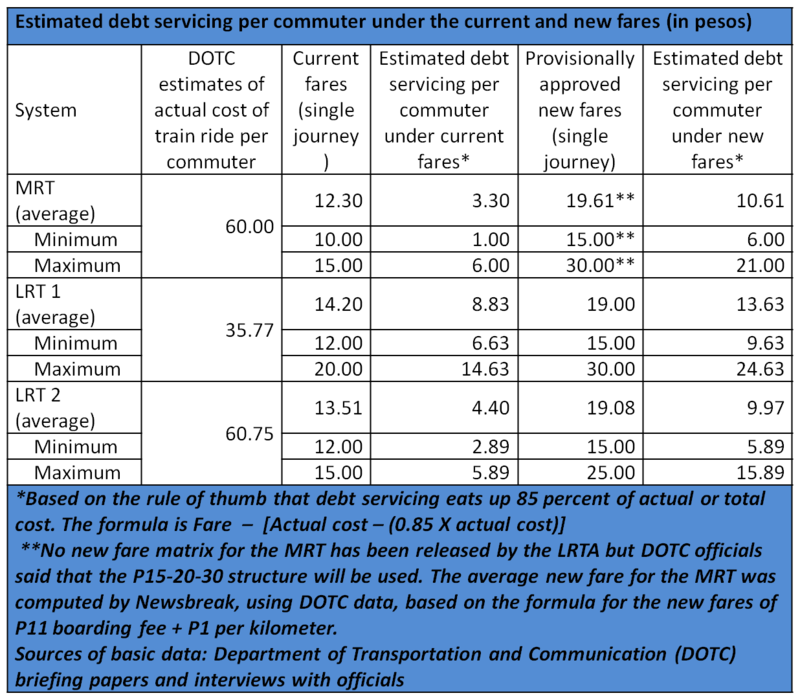 Without the debt, the cost of a train ride in MRT will turn out to be just P9, even higher than its current minimum fare of P10. But why is the issue of debt important? Isn’t it reasonable for the commuters to shoulder the cost of building the infrastructure which was funded by foreign debt? In the case of the MRT, the original proponents were private corporations that formed a consortium – the Metro Rail Transit Corp. (MRTC). I have already pointed out how these investors made a killing on the MRT due to their interlocking interests with the foreign and local banks that financed the project. They also borrowed in near commercial rates, which a DOTC official I spoke to said could have been avoided if the government was the proponent since it can avail of soft loans. Payments for these onerous debts are being shouldered by the commuters and taxpayers. The issue of debt also disproves the claim of the Aquino administration that there is a need for a fare hike because government is losing money. Such claim misleads the people into believing that MRT/LRT commuters pay below the actual cost of operating and maintaining the rail systems. As I showed earlier, they are paying even more than the cost of operation and maintenance. Government is losing money due to onerous contractual and debt obligations. Furthermore, it is not unusual for state agencies managing public infrastructure like the Light Rail Transit Authority (LRTA), which operates LRT 1 and 2, to be in the red because their performance is measured not in narrow financial terms but through the net social and economic benefits they bring. The new capability that results from public infrastructure such as improved mobility of the economy’s workforce, for instance, far outweighs what government deems as its “losses”. These losses are actually not losses in the business sense but public investment that go into achieving economic efficiency and improving the overall living condition of the people. By placing additional burden on commuters to settle the debts of the MRT/LRT, government is abandoning its obligation to provide the infrastructure needs of the people and the economy. The Aquino administration tries to conceal this dereliction of duty by peddling the twisted logic that it is unfair for Mindanao taxpayers to subsidize the MRT/LRT users in Metro Manila. The Filipino people are paying for the debts of the MRT/LRT in the same way that we are paying for the debts incurred to build infrastructure in Mindanao and elsewhere in the country. 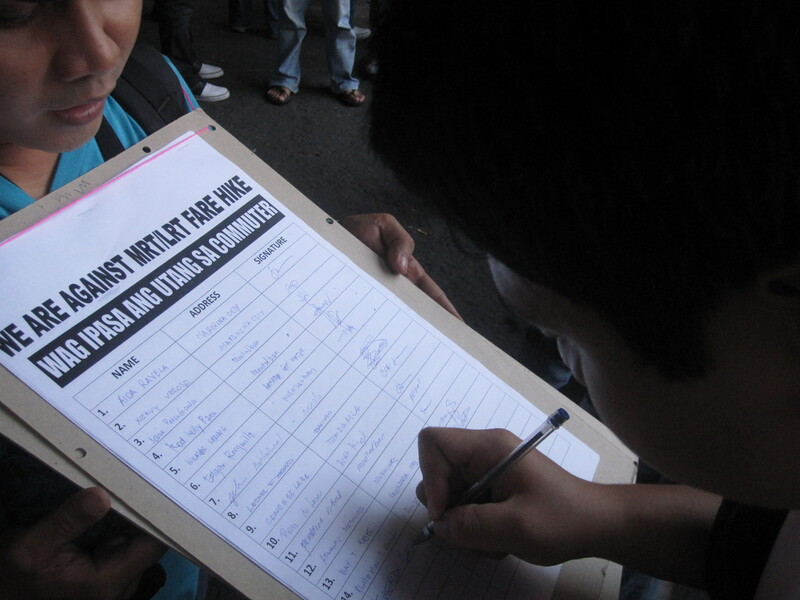 If Aquino is sensitive to the needs and interests of the people, he should be lessening, not intensifying, this burden. One way is to renegotiate with creditors – an option that even some technical people in the DOTC recognize as legitimate, particularly in the case of MRT – to reduce the impact on government’s scant resources. The country has so many odious debts dating back from the Marcos dictatorship up to the Arroyo government (for instance, read here) that a leader with strong political will and genuine concern for the people would work hard to abrogate. There is neither need nor urgency to increase the fares in MRT/LRT. If Aquino’s economic managers will insist that there is because of the precarious fiscal situation, then instead of unjustly burdening the people, they should advise the President to stop bailing out transnational corporations (TNCs) like what he did in the case of the Pagbilao coal-fired power plant which saved Japanese giants Tokyo Electric Power Co. and Marubeni Corp. from paying P6 billion in taxes. Or they can tell the Chief Executive to stop giving investors more state guarantees, which will be taken from the people’s money, such as the regulatory risk insurance Aquino promised to prospective participants in his public-private partnership (PPP) scheme.